Many ask for something Asian. And of course spicy, sweet and similar sauces come to mind, as well as pork and vegetables. Here is a good recipe for pork in a hot sauce with clear ingredients and the main thing it is very quick to prepare. 1. Prepare the ingredients to do everything quickly. 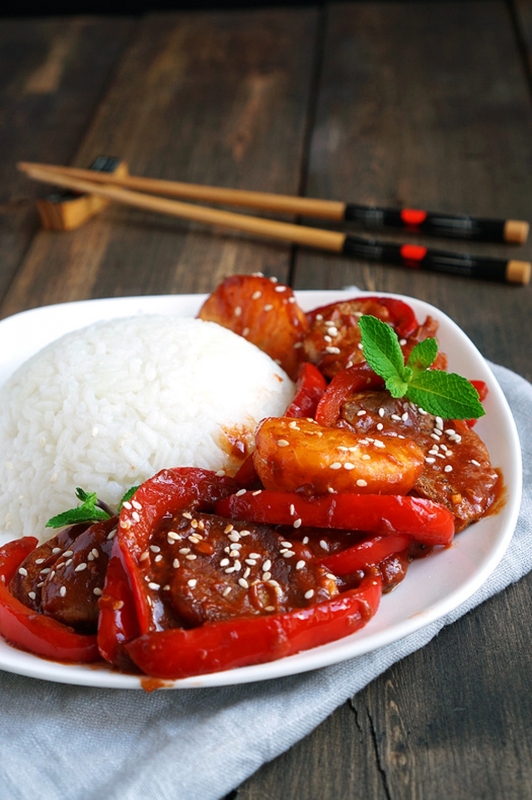 Cut ginger finely, peppers at thin straws, meat at small medallions or straws. 2. Pour two spoons of sesame oil into a hot frying pan and fry the pork. It is important to give space for meat. Therefore, it is better to fry in several approaches, so that there is free space between the pieces of meat. So it will be fried, and not stew. Fry from both sides until the appearance of caramel crust. 3. While the pork is frying, you can clear the tangerine lobules from white veins. 4. When the meat is ready, remove it from the frying pan and fry the pepper in the same oil for about 5-6 minutes until it becomes soft. If necessary, add a spoonful of oil. 5. Return all meat back to the pan, fry for 2 minutes. 6. Next, pour in the chili sauce. Here you can use both very spicy and vice versa sweet – which you prefer. And spices of ginger and cinnamon. 7. Fry for another minute and a half. Add the tangerines, mix well and serve with rice, and sprinkle with sesame seeds. 8. The taste is very interesting – on the one hand meat is well-roasted, tender inside. On the other hand, soft peppers, spicy sauce with notes of cinnamon, tender sour tangerines, which burst while biting, adding fresh citrus juice and taste. Very cool and simple. 9. Instead of tangerine, you can use more familiar pineapples, it will also be cool and more classic than that.